We opened at our new location on Panama City Beach on Monday. We are so excited. We have moved to 11501 Hutchison Blvd, which is in the Village of Grand Panama. They say location is everything. 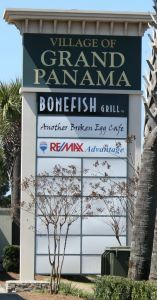 In this case we wanted to make this move not only to be more centrally located, but also to be in the midst of a professional center with lots of parking for our growing business on Panama City Beach. Anchored by Bonefish and Another Broken Egg the complex has undergone a couple of changes since being completed at the end of the real estate boom and bust of 2006. Instead of a retail focus the complex owners are going for a professional services approach. Already there is Mason Title, RE/Max Advantage Real Estate, Finch and Finch (counseling and leadership training) and now a beautiful new First Choice Physical Therapy. Others have already signed on and are moving in as we speak (a prominent entertainment and promotions company) or starting their build out (cosmetic vein and skin disorders clinic). There have been talks that could bring in a bank branch and the corporate office of a local retail enterprise. If you know of someone in search of a fantastic location in a professional complex, they can contact us for a tour of our facility and to hear our story first hand.